Northern California Health Care System. 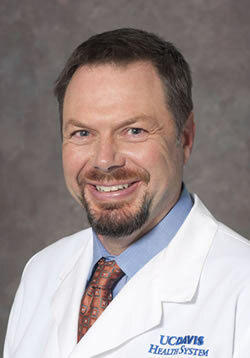 Dr. Mills, is an academic emergency physician at the University of California Davis and the Chief of Emergency Medicine at the VA Northern California Heath Care System. His undergraduate education was at the University of Oregon and he subsequently attended medical school at Oregon Health Sciences University in Portland. His lifelong interest in Trauma, including the treatment and prevention of injuries, was sparked in his EM residency at Charity Hospital in New Orleans, and his time as an attending at Parkland Hospital in Dallas. Commitment to the study of inquiry prevention paved the way for his Masters in Public Health from the University of Texas Houston. He currently resides in Davis California, with his wife and family. Dr. Beata Casañas is an Infectious Disease Specialist and Associate Professor at the University of South Florida, Morsani College of Medicine, Division of Infectious Diseases and International Medicine in Tampa, where she also underwent both her Internal Medicine and specialty postgraduate training after graduating from Nova Southeastern University College of Medicine in 1999. In addition to her variegated academic duties at USF, Tampa General Hospital and Hillsborough County Health Department, she is heavily involved in various research studies concerning HIV and Zika. She currently serves as Executive Medical Director of the Hillsborough County Health Department overseeing the Tuberculosis, HIV and Sexually Transmitted Disease clinics. Dr. Casañas is a well recognized expert in TB presentation and treatment and has already been a featured speaker at national and international venues in the last thirteen years. For the past two years, she has been a spokesperson and scientific advisor in mass media on Zika for USF and TGH. 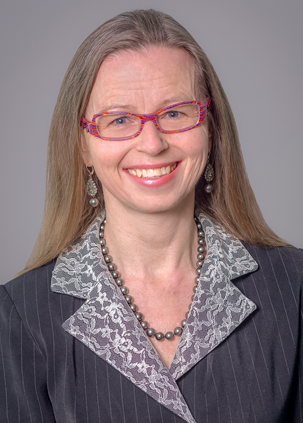 She has also been elected a Fellow of the Infectious Diseases Society of America in 2016. Recently, Dr. Casañas was promoted to Program Director of the Infectious Disease Fellowship at the University of South Florida, Morsani College of Medicine. Designation: Continuing Education, Inc. designates this live activity for a maximum of 12 AMA PRA Category 1 Credits™. Each physician should claim only the credit commensurate with the extent of their participation in the activity. This activity is approve for a total of 12 contact hours of Continuing Pharmacy Education (CPE) credit. Two twin beds that convert to Royal King, private balcony, sitting area with single sofa bed and private bathroom with tub. 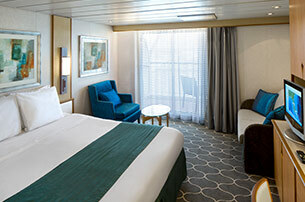 Stateroom: 221 sq. ft. Balcony: 61 sq. ft.
Grand Suites offer a comfortable bedroom two twin beds that convert to Royal King, a living area with single sofa bed, and a private balcony . Bathroom with tub. 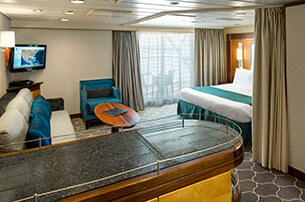 Stateroom: 327 sq. ft. Balcony: 111 sq. ft.
Master bedroom has a Queen bed and the second bedroom has three bunk beds ; two bathrooms and a private balcony. 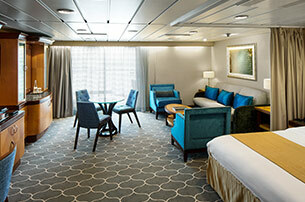 Stateroom: 377 sq. ft. Balcony: 78 sq. ft. These luxurious suites offer separate living areas, private balcony and a mini bar. Two twin beds that convert to Royal King, sitting area with double sofa bed, bathroom with tub and private balcony. 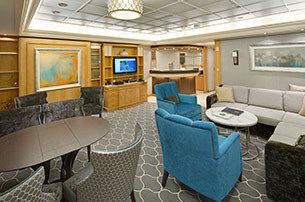 Stateroom: 446 sq. ft. Balcony: 108 sq. ft. This Royal Suite has a separate bedroom with two twin beds that convert to Royal King, a bathroom with whirlpool tub, living room with single sofa bed and a private balcony. 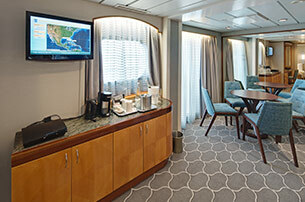 Stateroom: 700 sq. ft. Balcony: 147 sq. ft. 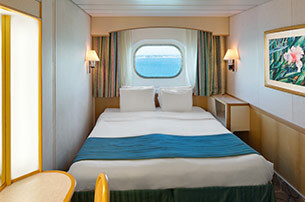 Ocean View staterooms offer a gorgeous view, two twin beds that converts to a Royal King bed and a private bathroom. Two twin beds that convert to Royal King, sitting area and a private bathroom. NOTE: Most Staterooms have an obstructed view. 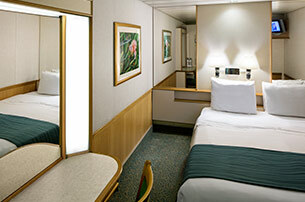 This standard stateroom offers two twin beds that convert to Royal King , and a private bathroom. 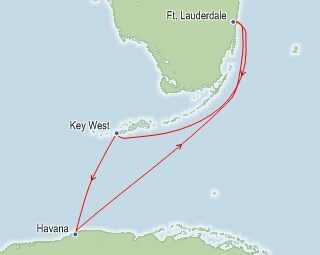 Port Charges, Taxes & Fees $255.78 per person.